A devastating fire has destroyed much of the private resort of Princess Cays which is owned by the Carnival Corporation and Princess Cruises. UPDATE: Carnival Cruise Line has decided to cancel the scheduled call on Wednesday for Carnival Pride due to the fire at Princess Cays. You can read about that right here. 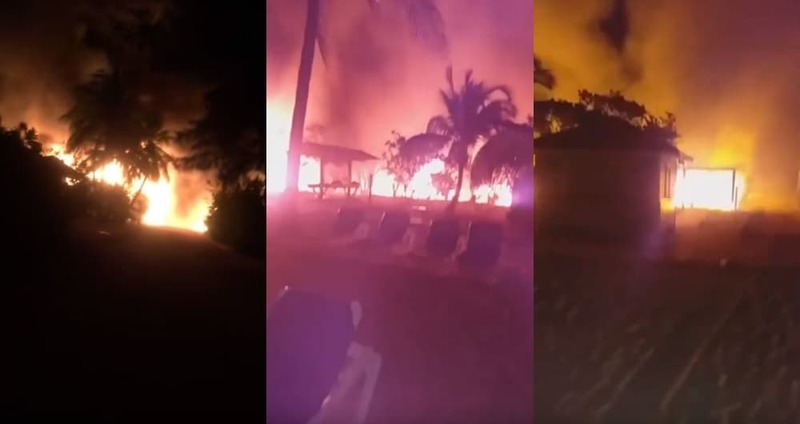 The popular private cruise destination of Princess Cays in the Bahamas has been devasted by a major fire which broke out sometime after 11:00 PM on Monday. The full scope of the damage is not yet known but seems to be widespread. Palm trees, bushes, and buildings can be seen covered in flames as locals are shocked at how this could happen. Fire trucks were deployed and according to local reports it may have started from the generator section and spread out from there. At the moment no injuries have been reported. The resort is located at the southern end of the island of Eleuthera in the Bahamas. It is a popular port of call not just for Princess operated ships but also sister brands like Carnival Cruise Line. Carnival Pride which is operated by Carnival Cruise Line is scheduled to call at the port on Wednesday. Those currently on the January 27 voyage should check to see how this could impact the itinerary. The next ship will be Carnival Ecstasy on February 2 and then Carnival Conquest on February 3. Princess Cays is a truly stunning location which offers white sandy beaches and tropical blue water. Ships have to tender passengers back and forward to the resort as there is no pier nearby. We just hope the damage is not too severe and that cruise ship guests can still continue to experience the port. We’ll be updating this post as more facts come in.